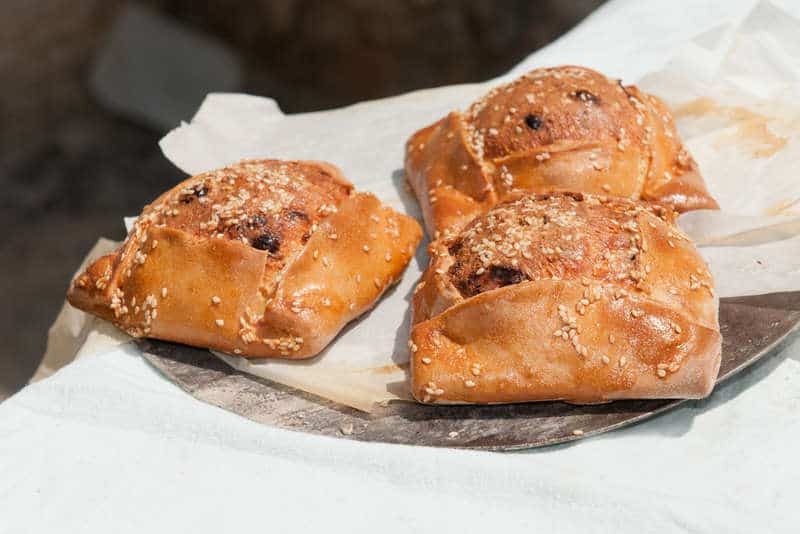 A traditional Cypriot Flaouna recipe (Flaounes), for you to prepare this delicious cypriot sweet & savoury desert to perfection! Flaounes are usually prepared over the Easter holidays with the whole preparation routine being a large family affair but as I absolutely love the texture and delicate flavours of this little treat, I always end up preparing them all year round! So I have put together my very best Flaouna recipe for you to try this delicious dish! Preparing Flaounas can be quite an affair with the whole family gathered around and helping with the preparation! Over Easter, Cypriot families usually make very large quantities of this delicious flaouna recie, hence the kitchen resembles more a production line with the adults preparing the mixtures for the flaouna and the kids doing all the assembly before taking them to the local bakery to have them cooked. In order to make the process a little less involved I have scaled down the quantities for this recipe so you can give it a try without having to buy a new oven! Preparing this traditional Flaouna recipe is relatively simple – but there are a couple of points to look out for. Firstly make sure you prepare your filling from the day before and let it rest in the fridge. This will allow your flaouna recipe filling to soak in all the delicious spices giving them their distinctive flavour. The second point to note is not to overwork the flaouna dough as you do not want the gluten to develop and become bread-like. And finally its all about getting the original flaouna ingredients – mahlab, mastic and the delicious flaouna recipe cheese, all of which you can find at your local Greek/Cypriot deli or online. Amazon stocks both mastic and mahlab and if you can’t find the cheese you can substitute with some grated plain haloumi and mild yellow cheese, like cheddar. And don’t forget – the sesame seeds are always sprinkled on the outside! So go ahead, give this delicious recipe a try and don’t forget to post your comments and feedback below! In order to have the best texture for your flaouna, it is best to prepare the filling from the night before or at least 4-5 hours before baking. This would allow the cheese filling to dry out and be able to absorb more of the “moisture” from the liquid flaouna ingredients. Start off by grating the cheese as fine as you possibly can. Add the beaten eggs, the raisins, the mint, the mastic, mahlab and the semolina and mix thoroughly. Cover it with a cloth and place in the fridge overnight or for at least 4-5 hours before baking. Next off start preparing the dough. The dough is more like a shortbread and not very bread-y hence be careful not to overwork the dough as your flaouna will be a bit doughy. In a large bowl sift the flour, add the salt, baking powder, the mahlab, mastic and mix thoroughly. Add the liquid ingredients to your flaouna recipe mixture which are the butter and eggs and gently mix the flaouna dough with your fingers. Dissolve the yeast in the warm water with the sugar, pour into the dough and then add the warm milk. Be careful for your water and milk to be only lukewarm and not hot as they will kill your yeast! Continue kneading the dough for a few minutes until the texture is firm but not bread-like. If the dough is too wet add a little more flour but be careful not to overdo it as you don’t want the flaouna to have a bread-y texture. Cover the dough mix with some cling film and let it rise for 1-2 hours or until it has almost doubled in size. Glaze the outer side of the flaouna dough with the whisked eggs and press it down on the sesame seeds. That will ensure that the seeds are firmly embedded in the dough. Grab a handful of the cheese filling and form a ball. Place in the centre of the dough (sesame seeds facing outwards), glaze the edges with a little more whisked egg and fold, pinching the corners together to form the flaouna shape. Once all your flaouna are shaped, place them on a baking tray lined with grease proof paper, let them rise for about 30-45 minutes and then bake in a pre-heated oven at 200C for about 40 minutes, or until golden brown. There is no mention of liquid ingredients so where are the measurements for the oil and eggs as mentioned at the start of number 4 of the Directions?